Type: Perennial with edible flowers and fruit which are called hips. Location: Full sun is best. Morning sun is critical. Planting: Roses can be installed year round if container grown. Bare rooted plants should be installed fall and winter. Cuttings can be taken early summer through fall. Bloom/Fruit: Flowers of many colors are followed by fruit called hips which contain the seed. The hips are ripe and ready to use when they change from orange to red. Growth Habits/Culture: Most roses are thorny, bushy or climbing. They all like well-drained soil in sunny locations. Growth varieties include low-spreading to tall bushes. The old roses, or heirlooms, are much better looking plants than the hybrids, and the flowers and hips are better for eating and using in teas. Roses need extra amendments in the bed preparation. Beds should contain more compost, volcanic material, rock phosphate, alfalfa meal, and other organic amendments than most other plants. The beds should be raised or mounded and the bare soil should be mulched year-round. The best mulch for roses is 1 inch of compost or earthworm castings following by 3 to 4 inches of shredded native cedar. Feed three times a season, and spray Garrett Juice weekly. Add garlic tea to the spray for minor insect and disease infestations. Problems: Black spot and other fungus problems are controlled by applying cornmeal to the soil any spraying with Garrett Juice plus garlic tea. Add potassium bicarbonate for severe disese infestations. Thrips are controlled with the same tools plus neem. Orange oil products can also be used. See the Organic Rose Program. Harvest and Storage: Dry petals and hips can be stored in a cool dark place. It's better to use the petals and ripe hips when they are fresh. Culinary Uses: The hips are used in sorbets, cakes, syrups, soups, jams, jellies, rosewater and wine. Use petals in salads, jellies, jams and desserts. Petals are best when the flowers first open. The petals and the hips can be used in teas. Medicinal Uses: A distillation of rose petals is used for eye baths and as a sedative. The hips contain lots of vitamin C and work as a diuretic, blood purifier and infection fighter. 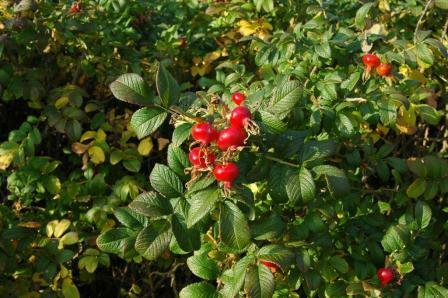 Rose hips were used by the ancients to build blood and stamina. Again take as a tea. Landscape Uses: Great plant for the landscape and perennial garden. Other Uses: Floral arrangements, potpourri and perfumes. Oil is distilled from flowers or pulled off the hexane. Insight: Old roses are the best choices for larger hips. Varieties: The best choices for useable hips include Old Blush, Rogosa spp., ‘Duchesse de Brabant’, ‘Souvenir de la Malmaison’, ‘Mutabilis’, ‘Katy Road Pink’, ‘Dortmund’, ‘LaMarne’, and ‘Belinda’s Dream’. Rosa rugos ‘Hansa’ and Rosa cania are especially good. Prepare rose beds by mixing the following into existing soil to form a raised bed: 6” compost, ½” lava sand, ½” of decomposed granite, 20 lbs. of dry molasses, 20 lbs. of whole ground cornmeal, 30 lbs. zeolite and 20 lbs. of sul-po-mag per 1,000 sq. ft. Remove all the soil from the root balls and soak the bare roots in water with Garrett Juice and one of the mycorrhizal fungi products such as Bio S.I. per label directions. Spread roots out radiating from the trunk and settle the soil around plants with water. For root stimulation, Garrett Juice and Bio S.I. can be added to the soaking water or added when watering in the plants. Use the products at the same mixing rates used for spraying. Round #1: organic fertilizer or dry molasses @ 20 lbs. / 1,000 sq. ft., zeolite @ 40 lbs. / 1,000 sq. ft. and whole ground cornmeal at 10 - 20 lbs. / 1,000 sq. ft.
For insect pest and disease control in general, spray roses every 30 days with Garrett Juice and garlic tea or Bio Wash.